I got my Thursdays down. If I can get out in time, that is. Here's the not-so-secret plan: get to downtown at around 6, or earlier. First order of business: The Edison Bar for $0.35 vintage cocktail (ends at 7 PM). The cocktail changes every week, but always well done. Strong tasty drinks. Depending on how fast you can finish your drink, you can either make it to Pitfire Pizza's happy hour right next door for 50% off food (ends at 7 PM). Or if you want to sip your cocktail slowly, you can also go to Pitfire armed with a Restaurant.com gift certificate. $10 certificate for $3, or $25 for $10. But wait, don't buy it then! They almost always have a sale or coupon discount for 60%-80% off! That's $25 for a mere $2 or so! From now May 31st 09 they're having a 80% off sale with code: SPECIAL. So I came with a girlfriend armed with my $10 gift certificate and walked into Pitfire Pizza at 7:05 PM. As I handed the girl at the register the certificate she said that it's happy hour til 7 PM and so everything's half off anyway! Well it was past 7 PM I almost pointed out ... but I didn't and took her offer. Luckily the gift certificate is good for a year anyway, so i'm saving it for a later time. Double sweetness! We each got Pitfire's individual-sized pizza and split em. 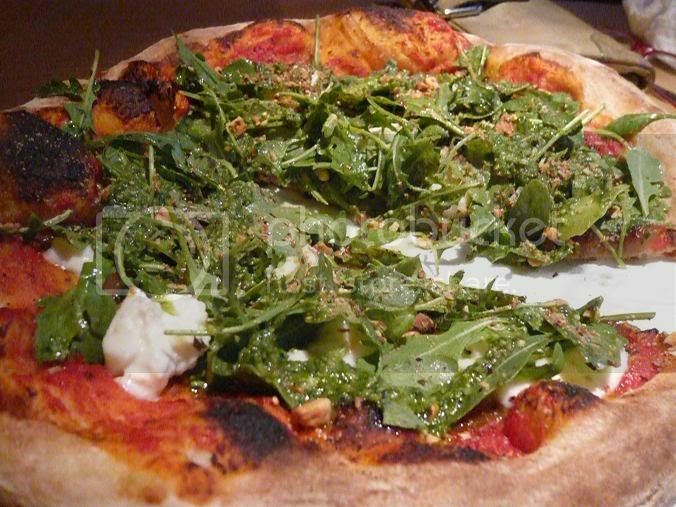 The burrata pie (burrata, tomato sauce, caramelized onions, arugula, hazelnut pesto drizzle - $9.95). I really love the texture play that the tiny hazelnut bits added to this. I liked Pitfire's thin crust although I do wish it was crispier so I would eat the edges too ... The pizza is pretty light, as it is not overwhelmed by the cheese and tomato sauce. Overall I liked the combination of this pizza a lot. Chunks of burrata and fresh arugula, topped with crunchy hazelnuts! Plus, pesto ... I loove pesto. $0.35 cocktail + $5 pizza. We made out like a couple of stuffed and buzzed bandits. 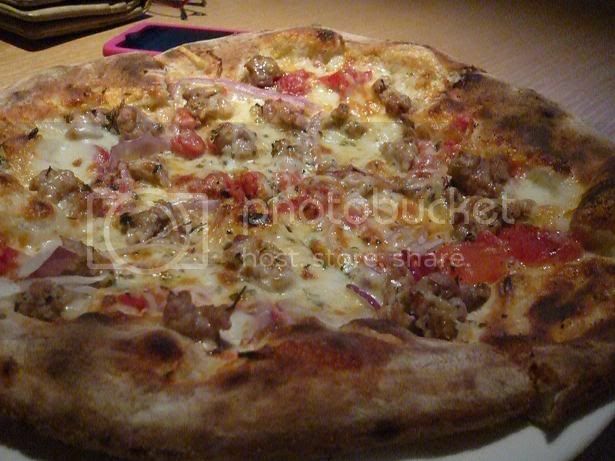 Read LA Pizza Man's review here and Sinosoul's review here. that's a sweet deal. i'd throw in going to MOCA on thursday nights after 5 for free too. if you're into that sort of thing. That's amazing! And the food looks great to boot! Thanks for the tip about the coupons on Restaurant.com... I'll have to check it out! I remember museums usually have a free day for students, but this after 5 thing sounds like it's free for everyone. Is that right? That's a fabulous deal. I'm always trying to get out early for the drink deal at the Edison, unfortunately that never happens. If I do get out early one day, I will definitely have to check out Pitfire Pizza while I'm out there. I love the deals for restaurant.com. If only I were 21, for that Edison deal. Mattatouille has a great idea. MOCA is free on Thursdays after 5, until closing time at 8.Now that's a Thursday. Great Food, drinks, and art. Woah, I can't wait to be 21. April 23: Caltech International Food Fair!